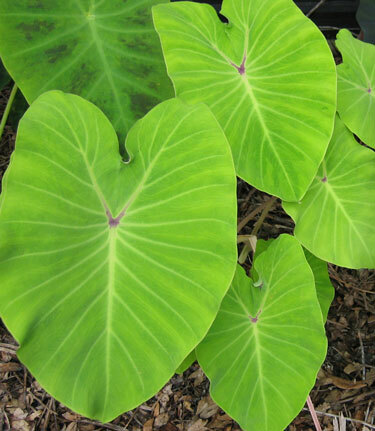 With deep green leaves accentuated by whitish or light green leaf veins. The leaves are roughly serrated. It matures at 3' - 4' height, and prefers part sun to shade. This is a deer resistant plant! 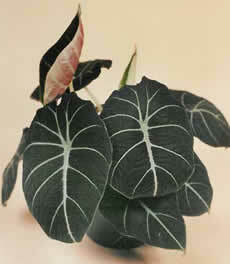 A beautiful dwarf variety which contains a significant amount of black coloration on the leaf surface. It matures at 12" - 18" and prefers part sun to shade. This is a deer resistant plant! 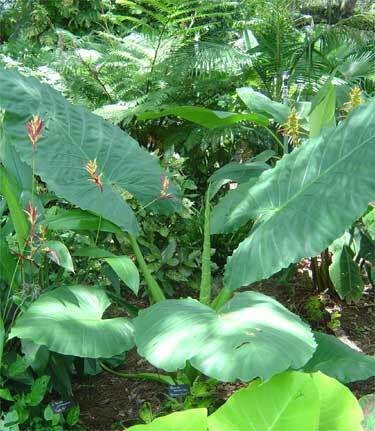 An extremely large growing Alocasia. Bright green, rippled foliage all summer. Matures at 7-10 feet in the ground. This deer resistant plant prefers part sun to shade. 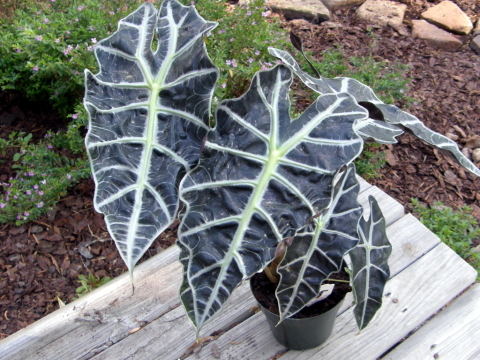 An extraordinary and beautiful new Alocasia! 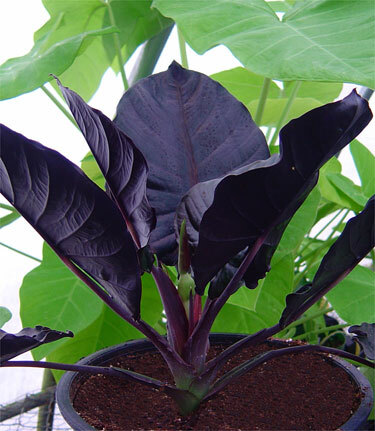 Small growing with nicely held erect leaves that are a lustrous black-purple! This deer resistant plant matures at 12" - 18", and prefers part sun to shade. A vey compact habit with reddish pink shading to purple pink near the margins. This matures at 15" - 24" high, and prefers part sun to shade. 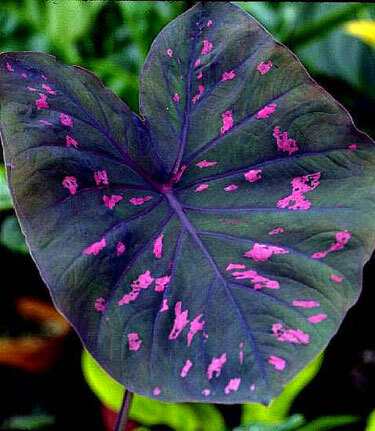 This unusual caladium has dusty purple leaves with splotches of bright lavender that turn to pale yellow as the leaves mature. This matures at 24" -26" high, and prefers part sun to shade. Large chartreuse leaves with pink viens. Excellent for color contrast. Matures at 24" - 36" high and prefers part sun to shade. 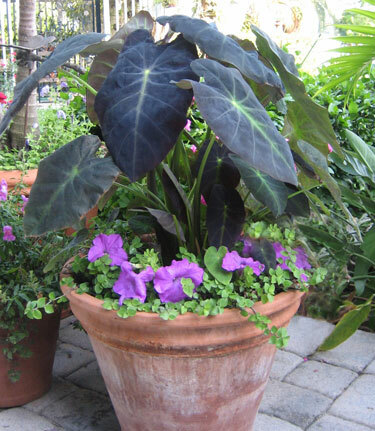 It has a much darker black leaf which gives it an overall richer look! It is a very impressive centerpiece in a mixed container. 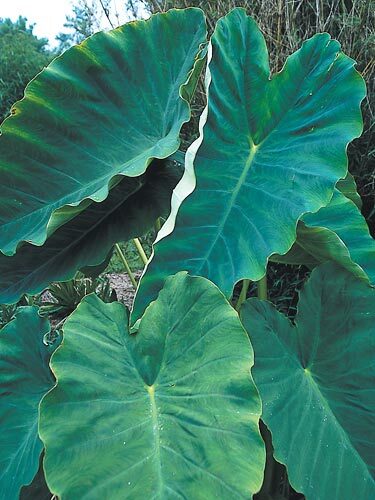 This deer resistant plant will mature at 4' -5' hi sun to part shade. The leaves can grow up to 4ft long and 3ft wide. Dark green foliage. This plant can grow up to 7 ft high! It is deer resistant and prefers sun to part shade. 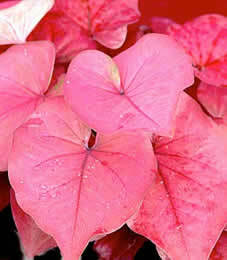 Fantastic combination of pink and jade, Pink China produces bright pink stems and a pink eye on the leaves . 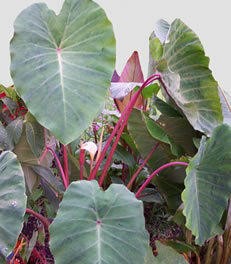 This deer resistant plant can mature at 6 ft high, and prefers sun to part shade. 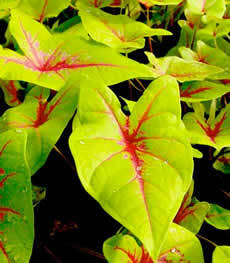 Ideal plant for containers, attractive bronze red foliage. This will mature at 24" - 30" high and prefer sun to part shade. It is deer resistant!